Government-controlled mortgage giant Fannie Mae (FNMA) earned net income of $3.9 billion in the third quarter, which ended Sept. 30. That was a drop of 55 percent from $8.7 billion at the same time last year, although higher than the $3.7 billion in the second quarter. Fannie Mae's quarterly increase in earnings came from higher net interest income and one-time $1.2 billion in penalty settlements from banks. Fannie Mae does not lend directly to consumers. It buys mortgages from banks and other lenders and bundles them into securities, which it sells to investors with a guarantee against default. Fannie Mae's revenue and earnings can vary widely based on changes in housing prices and interest rates. This quarter, for example, Fannie Mae's U.S. home sale index showed an increase of just 1.2 percent, and its revenue fell to $6.0 billion from $6.3 billion a year ago. 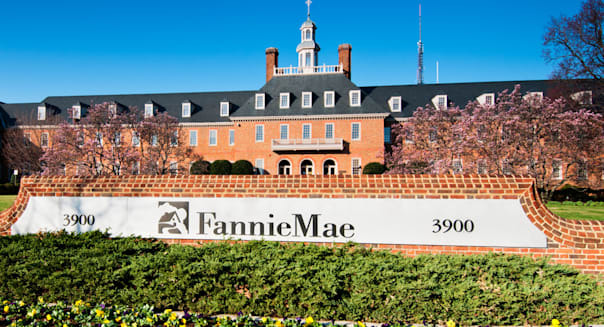 During the financial and housing crisis in 2008, Fannie Mae was taken over by the federal government, and its stock does not now trade on any exchange. The company received $116.1 billion in aid from the Treasury at that time, and must remit all of its profits under the terms of its bailout. After its next payment on Dec. 31, it will have returned a total of $134.5 billion to the Treasury, more than fully repaying the government. 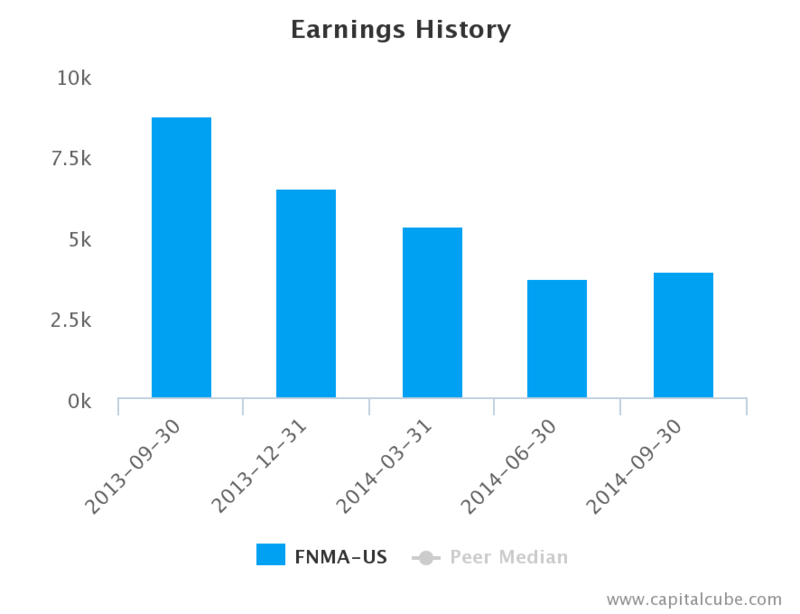 This earnings release follows the earnings announcements from the following peers of Federal National Mortgage Association: Bank of America Corporation (BAC), Federal Home Loan Mortgage Corporation (FMCC), First National Financial Corporation (FN), Nationstar Mortgage Holdings (NSM) and Wells Fargo & Company (WFC). Summary numbers: Revenues of $29.3 billion, Net Earnings of $3.9 billion and EPS of $-0.02. Net Interest Income Margins now 17.3 percent from 18.4 percent compared to the same period last year. Companies sometimes sacrifice profits in order to increase market share. 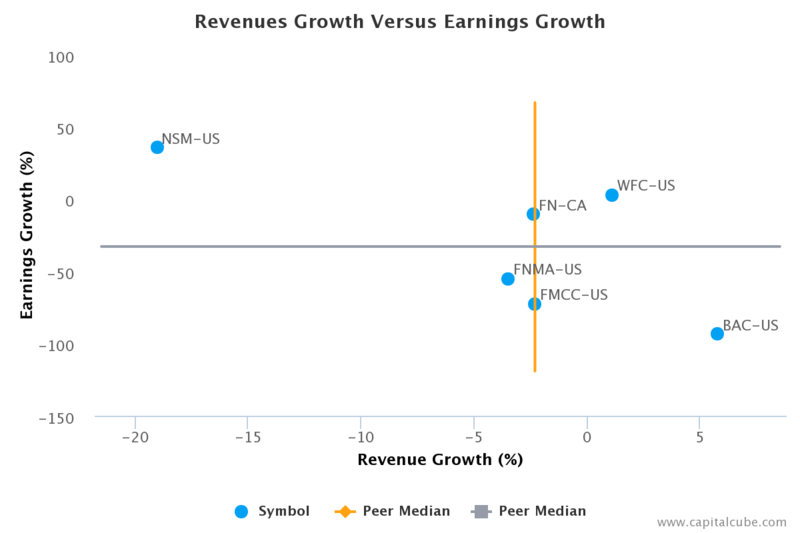 Capital Cube looks at revenue to judge market share activity and earnings to gauge profitability. The company's decline in earnings compared to the same time last year has been influenced by the following factors: (1) Decline in net interest income margins from 18.4 percent to 17.3 percent and (2) Issues with loan loss provisions. As a result, net interest income after provisions margins dropped from 26.9 percent to 21.0 percent in this period. 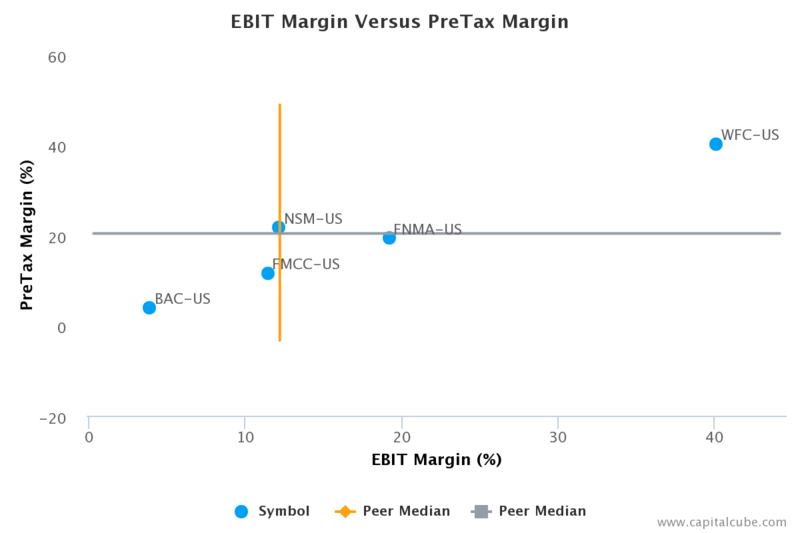 For comparison, net interest income margins were 14.3 percent and net interest income after provisions margins 20.2 percent in the immediate last quarter. 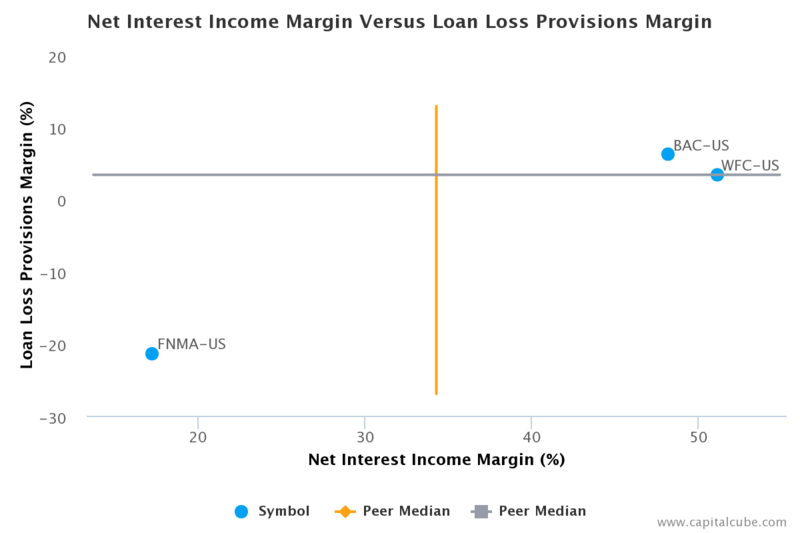 In addition, loan loss provisions as a percentage of net interest income were -46.7 percent 12 months ago, and -21.4 percent this period. The company's decline in earnings has been influenced by the following factors: (1) Decline in operating (EBIT) margins from 32.6 percent to 19.2 percent and (2) Accounting items that decreased pretax margins from 33.2 percent to 19.4 percent. 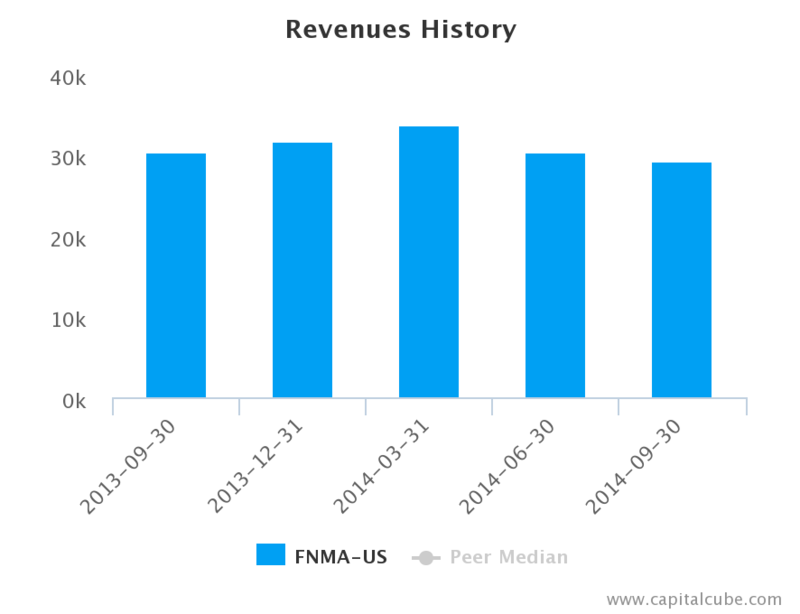 Federal National Mortgage Association is a government-controlled company. It provides liquidity, stability and affordability to the U.S. housing and mortgage markets and its activities include providing market liquidity by securitizing mortgage loans originated by lenders in the primary mortgage market into Fannie Mae mortgage-backed securities and purchasing mortgage loans and mortgage-related securities in the secondary market. The company operates through three segments: Single-Family Credit Guaranty, Multifamily, and Capital Markets. The Single-Family segment generates revenue primarily from the guaranty fees on the mortgage loans underlying guaranteed single-family Fannie Mae mortgage-backed securities. The Multifamily segment generates revenue from a variety of sources, including guaranty fees on the mortgage loans underlying multifamily Fannie Mae MBS and on the multifamily mortgage loans held in its portfolio, transaction fees associated with the multifamily business and bond credit enhancement fees. The Capital Markets segment invests in mortgage loans, mortgage-related securities and other investments, and generates income primarily from the difference, or spread, between the yields on the mortgage assets it owns and the interest paid on the debt the company issued in the global capital markets to fund the purchases of these mortgage assets. The company was founded in 1938 and is headquartered in Washington, DC. CapitalCube does not own any shares in the stocks mentioned and focuses solely on providing unique fundamental research and analysis on approximately 50,000 stocks and ETFs globally. Try any of our analysis, screener or portfolio premium services free for 7 days. To get a quick preview of our services, check out our free quick summary analysis of FNMA.